Cast your mind back to 2012 when Italian fashion label Marni launched their first and eponymous fragrance, ‘Marni‘. Created by perfumer Daniela Andrier, the nose behind many of Prada’s most recent offerings, this debut fragrance opted to be a little bit subversive and create something that was both playful and practical, capturing the spirit of the brand whilst remaining relatively commercial. The result is a vibrant, spicy rose scent that stands out amongst the many others of its kind, due to its quality and effervescence. Now, bring yourself back to the present day and let’s discuss ‘Marni Spice‘ the latest addition to the Marni fragrance collection, which includes the original scent and one other flanker called ‘Marni Rose‘. Much like the Marni Rose that precedes it, this latest edition has been created as a “new interpretation of the original bouquet”, this time showcasing the spicier facets of the Marni signature. The brand describe the fragrance as a “lively and spontaneous dialogue between strength and delicacy”, and that seems fitting to me. Marni Spice displays a different kind of vibrancy to the original, hinting at an exciting kind of androgyny. 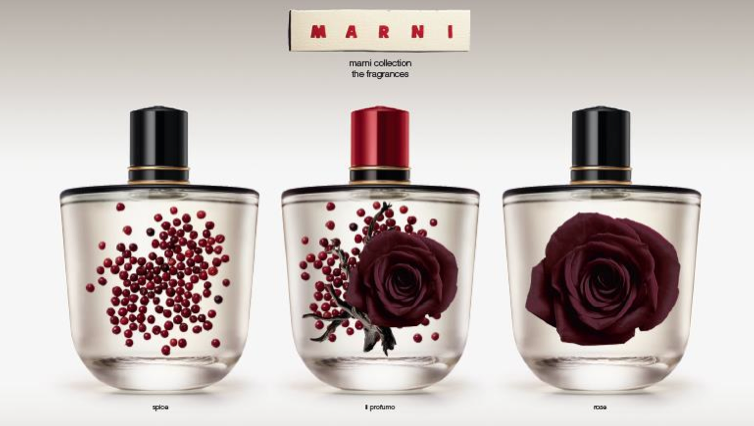 Marni Spice is clearly cut from the same cloth as Marni and Marni Rose, with each fragrance in the trio capturing a different section on the fragrant print of the Marni fabric. Marni Spice is all about the, you guessed it, spice, specifically the spicy aspects of the original. The fragrance predominately focuses on black pepper, crackling in the opening with the luminous air of crushed pepper corns and the aqueous sweet nature of cardamom. Despite the initial emphasis on spice, which continues right through the core of the fragrance, Marni Spice is recognisably ‘Marni’ and simply accentuates the original’s darker and more moody aspects. 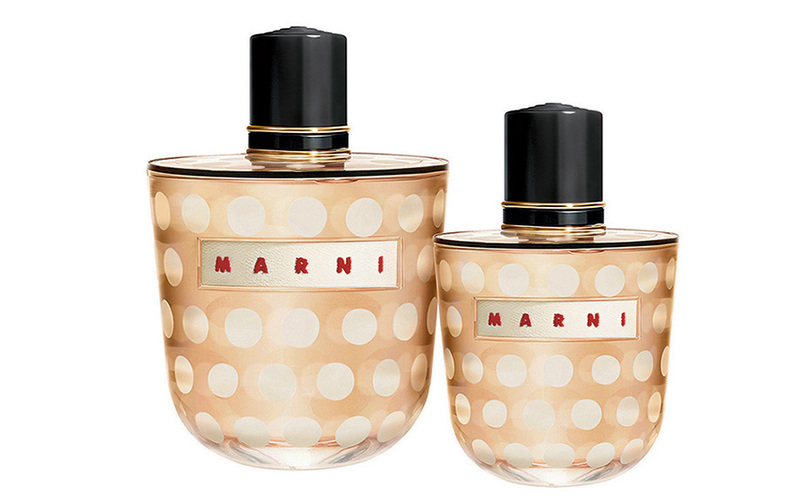 The original Marni paired tart red rose with shimmering black pepper and cool incense in equal proportions. In Marni Spice the balance has shifted somewhat, with the rose taking a considerable back seat to the spice and incense. The rose itself is still plush, ruby red, earthy and sweet, but the volume is dialled down removing the flower as the star on the red carpet to a member of the paparazzi flanking the runway. The VIP is the spice and in the heart black pepper and cardamom switch places with cinnamon and patchouli to create a fluffy gourmand texture that is almost savoury. In the base, Marni Spice becomes light and ethereal, whipping up delicate whiffs of silvery benzoin, incense and elemi. Much of the ‘body’ attributable to the spice and rose that dominates the first half peters out, leaving only an air of slightly sweet musk with hints of dark spice. It’s definitely on the lighter side, but there is something enjoyable about the delicacy of it all as things head into the far dry down. That said, a touch more volume wouldn’t go a miss (when does it not, I ask you?). I like Marni Spice about as much as I like the original, which is very much indeed (I’ve not tried the Marni Rose so cannot comment on that one). Much like the original, it wears relatively close to the skin and my only grumble would be that I’d like it to have a bit more oomph and presence. Despite its low-key sillage, Marni Spice is nicely done and would fit well for someone looking for a darker, more masculine version of the original. If you own Marni then I wouldn’t think that this spicy flanker would be a necessary addition to your wardrobe, unless you’re looking to complete the set. All-in-all this is a decent spicy rose fragrance that feels high quality without being showy or clichéd. I look forward to seeing what the brand does next. Marni Spice is available in 30ml (£49) and 65ml (£69) Eau de Parfum. It is currently exclusive to Harrods in the UK. Sample, notes and quotes via Marni. Image 1 via Marni. Image 2 via glamour.it. Posted in Feminine, Flanker, Marni, Rose, Spicy and tagged Consuelo Castiglioni, Fashion, Fragrance, Marni, Marni Rose, Marni Spice, Perfume, Rose, Spice. Bookmark the permalink. Any idea if, or when, it might be available in the U.S.? I had received a sample from my local Saks and loved it, but now I can’t find it. I have no idea, I’m afraid!